1964 Leap Year Baby T-Shirt - Let the world know you're a Leap Day Baby and let fellow Leapers know your birth Leap Year (great shirt for Leap Year Celebrations with lots of Leapers). 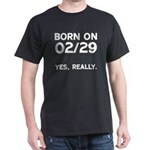 Kiss me leap birthday Women's T-Shirt - Kiss me I was born on February 29th shirt. Leap year / leap day birthdays.